the foremost techhub in the world. for both expats and professionals. 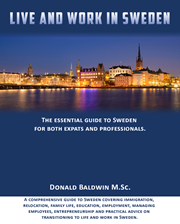 This is the companion website to the book Live an Work in Sweden which was written for the expat community from an expat perspective. There is a lot to understand about living, working and running a business in Sweden. The intent of the book is to provide a foundation of this knowledge in one convenient place. Live and Work in Sweden is a reference source for understanding important Swedish concepts. Throughout the book, Swedish language terminology and the accompanying glossary provide a quick reference with English definitions. To help convey a better understanding of important concepts, case studies and references are used throughout the book. To find out more about how our third-party links are used, check out the How to Use the Book section of the website. Much of the work in preparing the book and this website focuses on the need to communicate to different audiences, primarily in the expat community. The expat community consists of many people that often have many roles: can be married or sambo, with or without children, working as an employee or self employed, home owner or home renter. There are also situations that require important knowledge: child custody, inheritance, starting a business, education, healthcare and taxes to list just a few of the many topics covered in the book. During the second half of 2016, the Swedish immigration authority (Migrationsverket) has rejected a significantly large number of work permit renewal applications due to employer failings. As reported in the Swedish news media, most of the failings consist of the employer not meeting the conditions of employment as stated in one or more previous work permit applications. Many enterprises and professionals establishing themselves on the Swedish market have a hard time acquainting themselves with the Swedish tax system, and mistakes can be very costly even several years after the fact.